I just knew that somewhere in my stach of watercolors there was a bat lurking.....going thru a batch of things and there it was. 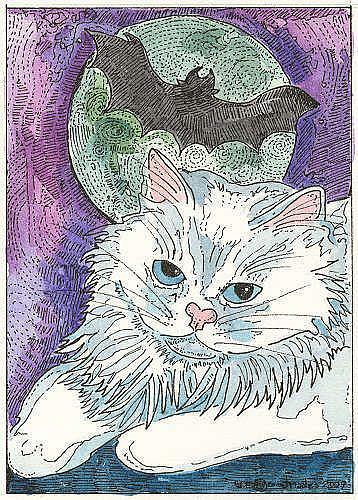 Not quite a Halloween bat and cat but nonetheless bats always remind me of Halloween. Bats remind me of late night swims when they would swoop over us in our backyard and we had been told as kids that they would get tangled in our hair if we didnt get out of the pool and come inside and go to sleep. We lived in our pool like a bunch of fish and our Mom always had trouble getting us out of the water.